When I was a child, I got a little thrill each time I visited the local library. This time, perhaps, I would find a Tintin book I hadn't already read. I adored their detailed artwork, broad humour, eccentric characters and, above all, their sense of mystery and adventure. Tintin's world was filled with the kind of nefarious intrigue and dastardly plots that just didn't happen in Montrose. There was but one great mystery for me to solve: had I read them all yet? Each Tintin album actually has the name and cover of the complete set of books printed on the back, so at first this seems a small problem. I eventually read all the ones I could see on these covers. But a quick google shows you that differing editions have different lists on the back. This increased the possibility that maybe, just maybe, there were books that weren't listed on any edition I'd read. I loved the books so much I enjoyed clinging to this hope. A quick google, I say. Therein lies the heart of my modern problem. 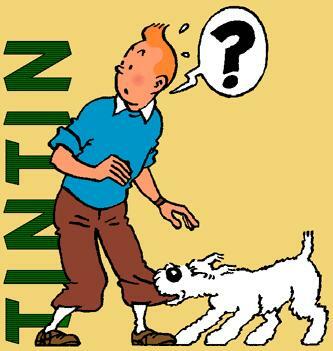 I don't know how adept I would have been at the web when I was, say, 9 but I reckon I would have figured out that Wikipedia have a comprehensive article on Tintin books. Indeed, the first google hit for Tintin takes you straight there, and the second section of the article has a bold, clear, authoritative list of all the titles. Of course, this information was probably available back then if I really, really wanted it, but it wouldn't be easy. The budget out-of-date encyclopedias that informed so many school projects probably wouldn't have a section on a Belgian comic book author, not one even as beloved as Hergé. The library index might reveal something, but probably only titles that were actually held somewhere in our lovely municipal library system, not every title ever actually published. My adult brain suggests a Hergé biography might do the trick, but even if the library had one I probably wouldn't have thought of it. I reckon I'd have had to write to the publisher or visit the State Library to get a definite list, both big undertakings for an 9 year old. I could find out if wanted to, but the point here is that I didn't really want to know. I enjoyed the anticipation, the thrill of a chance find, the maintaining of hope in the face of increasing evidence. It's probably as close as I ever came to Faith. These days, with the vast amount of information available to us instantly, we've lost these little mysteries. Sure, I could choose not to look at the information, but that's difficult when it's so easy. It's like chocolate for some people: if it's right in front of them, they'll indulge, but if it's not easily noticable or accessible they can resist. As you come to the end of a book you've really enjoyed, you may wish it wouldn't end, but you never stop reading. Back in 1983, if I'd had Wikipedia, I'd definitely have looked at the Tintin list. One can even be accidentally informed with so much up-to-date information. I've fairly studiously avoided spoilers for popular TV serials, wanting to enjoy them in my own time. Recently I thought I was safe to bone up / remember what the hell was going on in Battlestar Galactica, as they were about to begin airing the delayed final series. Turns out it had already begun to air and I suddenly knew the identity of the final Cylon. To use a recent meme, what has been seen cannot be unseen. (I now feel memetically behooven to write KILL IT WITH FIRE despite it being completely inappropriate. Must stop reading reddit so much). I feel a little sad about these lost mysteries, but anyone who knows me knows I'm an ardent fan of the information revolution, so I have to take the good with the bad. We always look back with nostalgia at our youth. Kids today actually have it great - imagine having all that information at your fingertips when your brain is so able to absorb it! And we may have lost the little mysteries, but we still have the big ones to ponder. Despite this seemingly limitless array of information, there are still an astonishing number of quite fundamental things we don't know. Why do we age? Why do we sleep? What started life? If you know any nine year old mystery fans, tell them there's lots more to look forward to when they grow up.